House Democrats are planning to vote on a bill backed by Sen. Elizabeth Warren (D., Mass.) that authorizes a locally opposed Indian casino tied to lobbyists and a foreign gambling giant, according to a new report. The legislation to support the Mashpee Wampanoag's efforts to build a casino will be taken up on March 25, despite not having been debated or marked up by the Natural Resources Committee, RedState reports. The tribe involved also has shady finances and received past support from disgraced lobbyist Jack Abramoff. 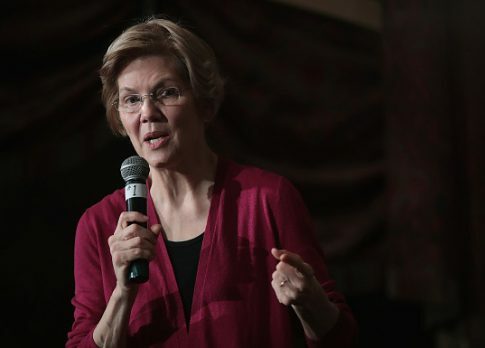 Warren's embrace of the legislation alongside the rest of Massachusetts's congressional delegation raised eyebrows, given her well-known Native American heritage controversy and her longtime hostility to expanding legalized gambling. The bill is being supported by lobbyists for the Malaysian gambling giant Genting, which the Free Beacon reported last year had invested $300 million in the project and could lose it all. Warren, while running the first time for the U.S. Senate in 2011, strongly opposed ultimately successful efforts to expand casino-style gambling in Massachusetts, the Free Beacon reported. She also supported an unsuccessful ballot initiative to repeal the expansion on economic grounds in 2014. However, she took a turn in 2018, speaking out against the Trump administration when the Department of the Interior ruled against the tribe. If the law passed, it would force the department to designate 320 acres of land owned by the tribe into a federal trust, which would designate it as a tax-exempt Native American reservation. That was the same year she also released a widely panned DNA test purporting to prove her longtime claims of Native American ancestry. Warren ultimately apologized for the test, which revealed she may be as little as 1/1,024th Native American, and for identifying her race as American Indian during her legal career. "I am not a person of color," she said in Iowa in January. "I am not a citizen of a tribe. Tribal citizenship is very different from ancestry. Tribes and only tribes determine tribal citizenship and I respect that." In addition to her message of creating what she a rigged economic system against working Americans, Warren's 2020 presidential campaign has centered around battling corruption and the influence of lobbyists in Washington. She boasted in her presidential campaign launch speech in February that she had championed the most aggressive anti-corruption law since Watergate. "Shut down the revolving door between Wall Street and Washington. End lobbying as we know it. And while we’re at it, ban foreign governments from hiring lobbyists in Washington," she said. The casino bill likely wouldn't become law, even if it passed the Republican-majority Senate. President Donald Trump opposes the legislation, RedState reported. This entry was posted in Politics and tagged 2020 Election, Department of the Interior, Elizabeth Warren, Ethics, Gambling, Massachusetts, Native American. Bookmark the permalink.